This is the first trailer for the historic saga Redbad. 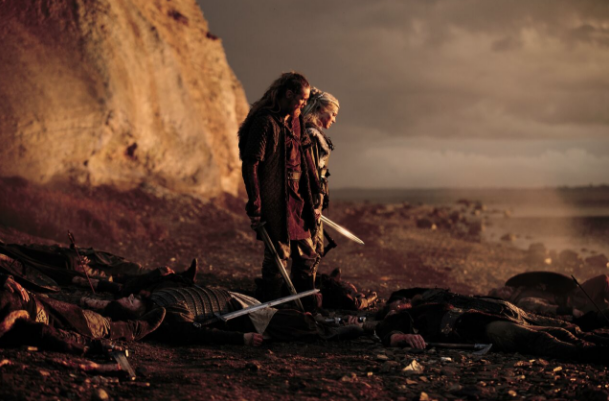 Epic Pictures Releasing acquired the North American rights to Redbad, an action-packed adventure directed by Roel Reiné (ADMIRAL, BLACK SAILS, INHUMANS). It is produced by Klaas de Jong of Dutch via Farmhouse TV & Film Productions and stars Jonathan Banks (BREAKING BAD, BETTER CALL SAUL), Søren Malling (THE KILLING, BORGEN) and Gijs Naber (TULIPANI, THE HEINEKEN KIDNAPPING). Check out the synopsis and trailer below. "AD 754. Northern Europe is divided into two different worlds: above the rivers are the Frisians, the Saxons and the Danes. Below the rivers, the Franks hold sway. Their aim is to do what the Romans never managed and conquer all of Europe, using their new weapon to subjugate the heathens: Christianity. They have their eye on the most important trade center of Europe, ruled over by the Frisian king Aldigisl. This film is a historic, action-packed epic about the rise of Christianity and the sagas and the ancient legends of Redbad."